Confessions of a Sewing Dork is asking for touching/funny/sad tales of unfinished projects. This is my story. 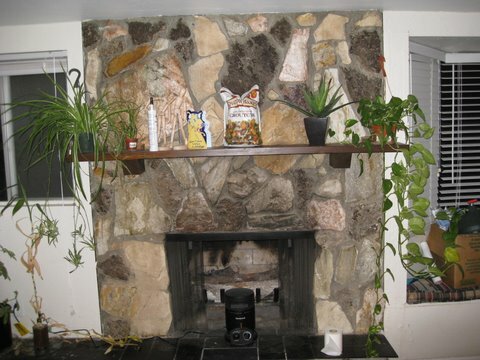 Here’s the fireplace in our sunroom. We have lived in this house for 15 months and still have not unpacked everything or done any decorating, and this room is no exception. The cardboard box at far right sits on a hideous striped cushion on the window seat, a cushion I had vowed to replace immediately and a window seat I pictured as a cozy reading nook. Times I’ve sat in the window seat, sipping a cup of tea and reading while gazing out into the back yard? Zero. A Christmas tree stand pokes out the top of the box, even though I haven’t a tree in three years. I saw the stand again when I was cleaning the poo room after the dog died, to make it once again the sun room and not the dog-slash-poo room, and it was like I saw it for the first time. My eyes had started simply skipping over it, I didn’t realize it was there anymore. “Oh hey, we still have a Christmas tree stand! That will be handy when I get a tree again this year! I should put that away somewhere. Then again, Christmas is only a little under 3 months away, that’s not really all that far away, maybe I could just let it sit there…” And sit there it did. 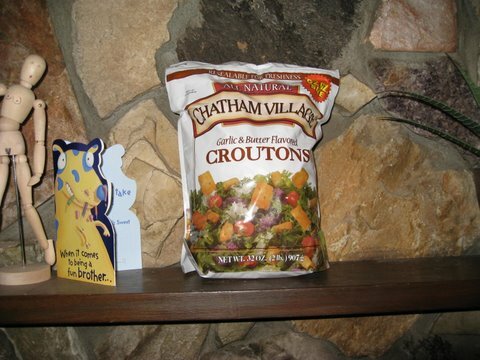 Also, take note of the giant bag of croutons in the place of honor in the middle of the mantlepiece. That’s been there ever since a friend gave it to the man of the house for his birthday as a joke right when we moved in during August 2008. A few days later, one of us was holding a bunch of stuff in our hands including the croutons and needed to put something down for a moment. The mantle was handy so the crouton bag was set down just for a moment. And never picked up again. Some people have pictures of family on their mantle, others display a prized collection, or they remember a departed loved one with an urn of ashes. Most people use the space to display something meaningful to them. I use it as a resting spot for a two pound bag of croutons and a pair of wooden movable figures with drawn-on anatomy, another birthday gift from friends. Unfinished project: Sunroom decoration. Estimated completion time: indefinite. November 20, 2009. Tags: mantle, sunroom. Pictures, Words. 4 comments.